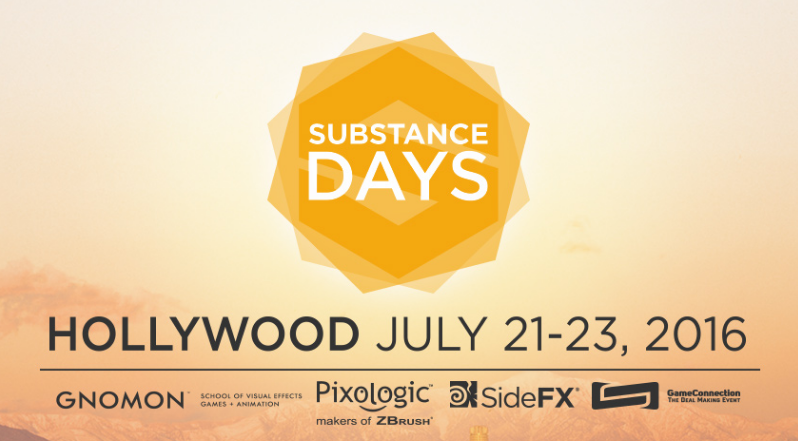 Save the date: Substance Days is coming to Hollywood from Thursday, July 21 until Saturday, July 23. Today, we are proud to announce the first-ever Substance Days in Hollywood on July 21-23, presented in partnership with Gnomon, Game Connection, Pixologic and SideFX. Substance Days is a 3-day celebration of all things Substance created by and for you, the Substance community. This is the place to be to sharpen your skills with the best Substance artists, connect with fellow artists and developers, and see what’s ahead for Substance in a relaxed and friendly atmosphere. Class size is limited to 15 participants per class, so register now! Allegorithmic’s CEO Sebastien Deguy will talk about the past, present and future of Substance during a special livestreamed keynote session. During this event we will also announce the winners of the ongoing contest: A Road Trip in 2116. It will be immediately followed by the grand opening of a Substance Art expo in the Gnomon gallery and guests will be able to enjoy live music, food and drinks until late in the night. The keynote, gallery opening and bbq/music are free events but space is limited so please register now! Can’t attend a Masterclass? Come and join us Saturday for a full day of conferences, including the unveiling of Substance Designer 5.5, sessions covering creating Uncharted 4’s environment art with Substance, character art for film, a look at the Substance roadmap, and more. We’ll also have some exciting Substance challenges for attendees to compete in during the day. Saturday’s events are free, but again space is limited, so show up early and register now! We are really excited about this opportunity to meet and chat with our fellow artists and creators. This is hopefully the first of many learning and networking events we’ll set up in the future for the Substance community. We can’t wait to see you in Hollywood next month! Here are the archived presentations from Substance Days. Scan Blending Demo in Substance Painter.